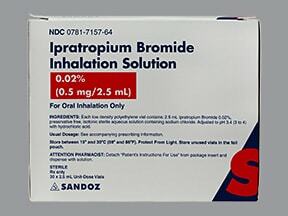 Ipratropium is used to control and prevent symptoms (wheezing and shortness of breath) caused by ongoing lung disease (chronic obstructive pulmonary disease-COPD which includes bronchitis and emphysema). It works by relaxing the muscles around the airways so that they open up and you can breathe more easily. Controlling symptoms of breathing problems can decrease time lost from work or school. 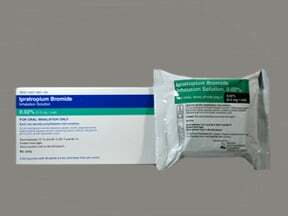 For preventing symptoms of lung disease, this medication must be used regularly to be effective. 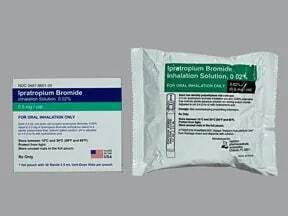 Use your quick-relief inhaler or nebulized solution (such as albuterol, also called salbutamol in some countries) for wheezing or sudden shortness of breath unless otherwise directed by your doctor. 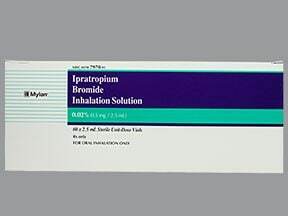 Ipratropium does not work as fast as your quick-relief medication, but may sometimes be used together with your quick-relief medication to relieve symptoms of wheezing or sudden shortness of breath if so prescribed by your doctor. Read the Patient Information Leaflet if available from your pharmacist before you start using ipratropium and each time you get a refill. 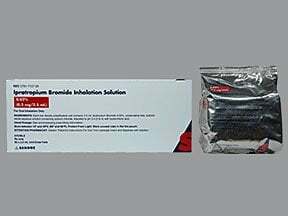 This medication is used with a special machine called a nebulizer that changes the solution to a fine mist that you inhale. Learn how to prepare the solution and use the nebulizer properly. 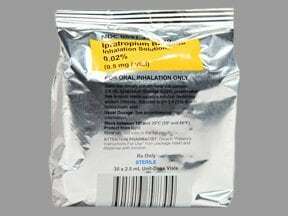 If a child is using this medication, a parent or other responsible adult should supervise the child. If you have any questions, ask your doctor, pharmacist, or respiratory therapist. Inhale this medication into your lungs using the nebulizer as directed by your doctor, usually 3 to 4 times a day (6 to 8 hours apart). Avoid getting this medication into your eyes. It may cause eye pain/irritation, temporary blurred vision, and other vision changes. Therefore, it is recommended that you use a mouthpiece rather than a face mask with the nebulizer or that you close your eyes during use. Each treatment usually takes about 5 to 15 minutes. 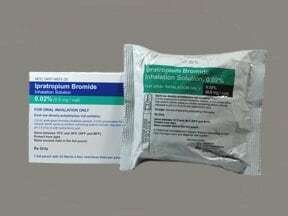 Use this medication only through a nebulizer. Do not swallow or inject the solution. To prevent infections, clean the nebulizer and mouthpiece/face mask according to the manufacturer's directions. Rinse your mouth after treatment to prevent dry mouth and throat irritation. 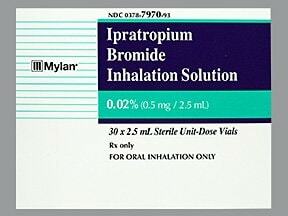 Ipratropium may be mixed with other medications (such as albuterol) or saline if directed by your doctor. Follow your doctor's instructions carefully. Once a vial is opened, throw away any unused solution. If you are directed to use this medication regularly, it works best if used at evenly spaced intervals. To help you remember, use it at the same times each day. Do not increase your dose, use this medication more often, or stop using it without first consulting your doctor. 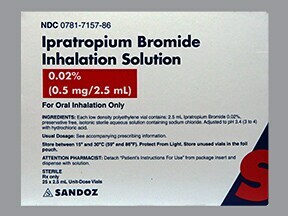 What conditions does Ipratropium Bromide Solution, Non- treat? Dizziness, nausea, stomach upset, dry mouth, or constipation may occur. If any of these effects persist or worsen, tell your doctor or pharmacist promptly. Infrequently, this medication may cause severe sudden worsening of breathing problems right after use. 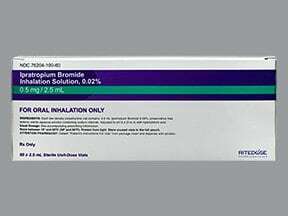 If you have sudden worsening of breathing, use your quick-relief medication and get medical help right away. Tell your doctor right away if you have any serious side effects, including: fast/pounding heartbeat, difficult/painful urination. 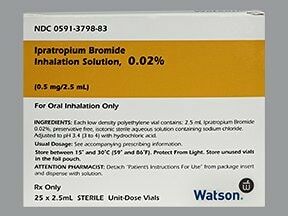 List Ipratropium Bromide Solution, Non- side effects by likelihood and severity. 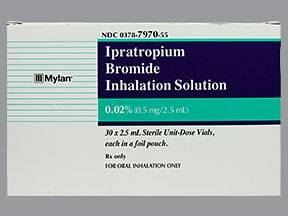 Before using ipratropium, tell your doctor or pharmacist if you are allergic to it or to tiotropium; or to atropine or other belladonna-type drugs; or if you have any other allergies. This product may contain inactive ingredients, which can cause allergic reactions or other problems. Talk to your pharmacist for more details. 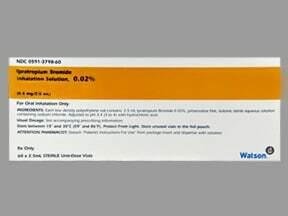 Before using this medication, tell your doctor or pharmacist your medical history, especially of: personal or family history of glaucoma (angle-closure type), difficulty urinating (for example, due to enlarged prostate). This drug may make you dizzy or blur your vision or cause vision changes. Alcohol or marijuana can make you more dizzy. Do not drive, use machinery, or do anything that needs alertness or clear vision until you can do it safely. Limit alcoholic beverages. Talk to your doctor if you are using marijuana. 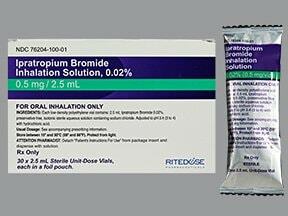 What should I know regarding pregnancy, nursing and administering Ipratropium Bromide Solution, Non- to children or the elderly? 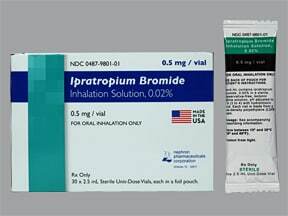 Does Ipratropium Bromide Solution, Non- interact with other medications? 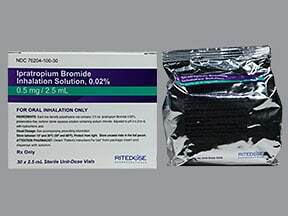 Are you taking Ipratropium Bromide Solution, Non-? 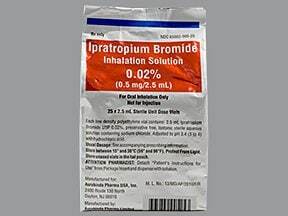 Are you considering switching to Ipratropium Bromide Solution, Non-? 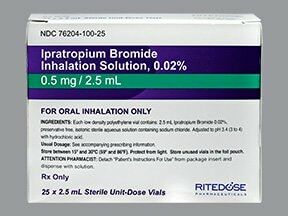 How long have you been taking Ipratropium Bromide Solution, Non-?